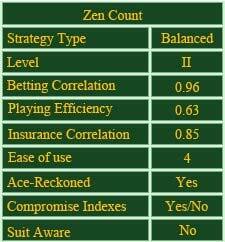 As well as Hi-Opt 2, Zen Count is a more complicated card counting system than Hi-Lo or KO Count for example. This system first appeared in Arnold Snyder's book Blackbelt in Blackjack where he described Zen Count in details as being a really profitable system for an intermediate player. As well as other systems, Zen Count is based on basic blackjack strategy; and every card of a deck has its own value: you start with 0 and add/subtract 1 or 2 points each time when you see a card dealt from a shoe. Zen Count is not the easiest system of course, but it cannot be called the most difficult one too. First of all, you should know the value of each card. Zen Count differs from other counting systems here because it does not count an Ace being neutral though many systems do that. So, thanks to Zen Count, you should not use Aces in side-counts but subtract 2 points each time when an Ace appears on the table. As well as many other counting systems, Zen Count is a balanced one: it means that you are welcome to increase your bet every time when your count total is positive and decrease it when your count total is negative. The final result of your counting should be 0 after the last card is dealt from a shoe. But remember that a dealer also has a chance to beat you even when your count total is high. So, do not forget about blackjack secrets and use trustworthy tips in order to win at blackjack. Zen Count is usually used by advanced blackjack players but it does not mean you should not try it; the main thing is a good practice. And do not forget about basic blackjack strategy! If you are interested in some more card counting systems to try, Omega II and Red Seven are worth your attention: a professional blackjack player is always ready to learn something new concerning the game.